What is “Sukhaasan” of Sri Guru Granth Sahib Ji and the proceedure? Sri Guru Granth Sahib Ji being carried to be placed on a bed. Sukhaasan means “easy pose” or posture of rest, peace and tranquillity. At night after Sodar Rehraas, Guru Ji’s Saroop (Volume) is put to rest (i.e. ceremoniously closed and placed) in a special room or place, but before being moved, Guru Ji is put into Sukhaasan. In essence, it is the reverse of the Prakaash ceremony. Sukhaasan takes place after the sun goes down, or at any time before Guru Ji’s Saroop is moved, such as at the completion of Gurdwara ceremony when Guru Ji is to be moved. 1. The sewadaar (volunteer) serving as the Granthi takes a Hukamnaama. 3. Guru Ji’s Saroop is placed in the centre of the Manjee Sahib (raised platform/cot), it is covered with one or both side rumaalas. The Granthi covers his or her head with a clean towel or (cotton) cloth and then places Guru Ji’s Saroop on their head. 5. Guru Ji is lowered onto the rumaalas on the Palki Sahib. 6. Siri Guru Granth Sahib Ji is then neatly wrapped, one rumaala at a time. One corner at a time, the rumaala is folded inwards. Having done this, the side side rumaalas (palkeeaan) are placed on top of Guru Ji’s saroop and then the large rumaala sahib is placed over. 7. Ardaas is recited. This may be a short, abbreviated Ardaas. He nimaaniaan de Maan, nitaaniaan de Taan, niohtiaan di Oht, Sache Pitaa Vaaheguroo! 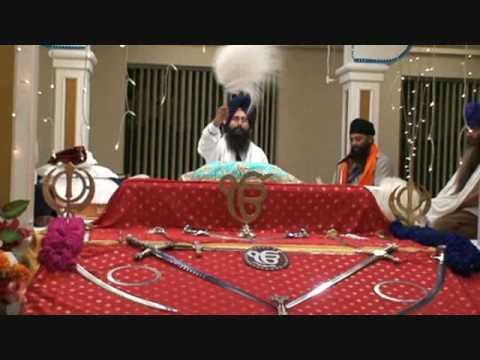 Guroo Gareeb Nivaaj, Dhan Sree Guroo Granth Sahib Jee, aap de hazoor sukhaasan dee ardaas hai jee. Aap jee ne amrit-vele to lai ke hun tak saadh sangat noo darshan de ke nihaal keetaa hai jee. Aap Jee daa Sukhaasan Asthaan tiaar hai, kirpaa kar ke Sukhaasan asthaan te biraajmaan hovo jee. Akhar vaadhaa ghaataa bhul chuk maaf karnee. Se-ee piaare mel, jinhaan miliaa teraa naam chit aave. Naanak Naam chardikalaa, tere bhaane sarbat daa bhalaa. Vaaheguroo Jee kaa Khaalsa, Vaaheguroo Jee kee Fateh. Bole so nihaal, Sat Sree Akaal! “Jithai jaae bahai mera sat guroo so thaan suhaavaa raam raaje. Gusik hee so thaan bhaa liaa lai dhoor mukh laavaa. Gursikhaa kee ghaal thaae peyee jin har naam dhiaavaa . 9. A short Ardaas may be recited at the Guru’s resting place (however this is usually done if it is different location i.e. Guru Ji’s saroop has come from someone’s house back to the Gurdwara Sahib). “Bole so Nihaal . . . Sat Siree Akaal!” is proclaimed, so that all nearby may know that the Guru is now safely at rest. « What is “Parkaash” of Sri Guru Granth Sahib Ji and the proceedure?